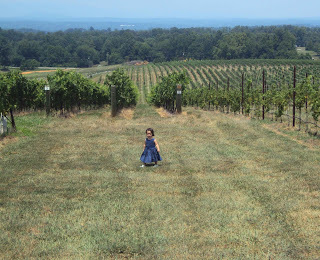 Raffaldini Winery- Happy 21st Birthday, Jaclyn! 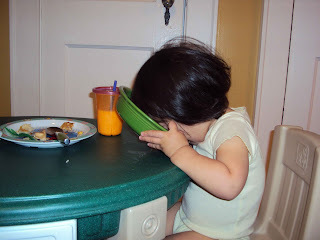 Good to the Last Drop! 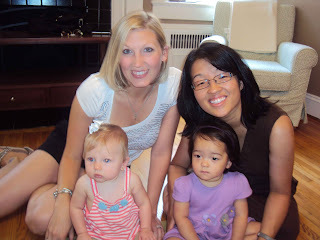 Tiffanie, Addison, Katy and I- what a difference a couple of years make! 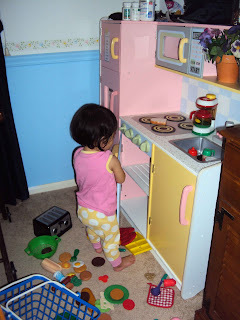 Katy and Addison "cook" up something tasty. My friend Tiffanie and her daughter, Addison were in town, this week. 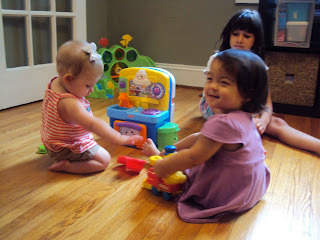 They were able to come over for lunch and we had fun catching up and getting the girls together to play. You loved playing with Addison, Katy! You kept giving her hugs and showing her all of your toys. If only they lived closer, you two would be best buds, for sure! 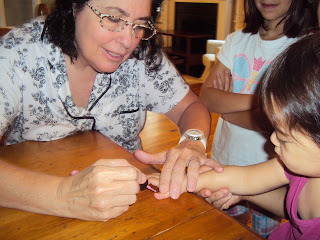 Yesterday, Grandma Tinkey pulled out the nail polish and did you nails, Katy. 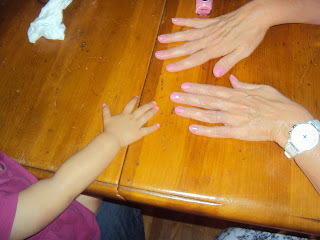 This was your first real "manicure." I didn't think that you'd sit still long enough for the polish to dry but you proved me wrong, Katy! You were so fascinated with the process and love the color pink, that you stayed still just long enough to get your nails painted and dry. You are all girl, Katy! 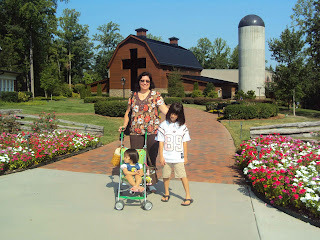 Grandma Tinkey is in town and we went to the Billy Graham Library, today, Katy. We toured the library and learned all about the life and works of the evangelical crusader, Billy Graham. The exhibits were interesting, informative and engaging. You were very good throughout the two hour tour, Katy! Grandma's reading glasses were very helpful in keeping you entertained when you go tired of the exhibits- hee, hee. After the tour of the library, we met Elizabeth's mom, Miss Crystal, for lunch at the BGEA headquarters (where she works). We enjoyed a delicious lunch in the beautiful dining room of BGEA headquarters. Later, Miss Crystal showed us where she worked and took us around to meet some of her co-workers. 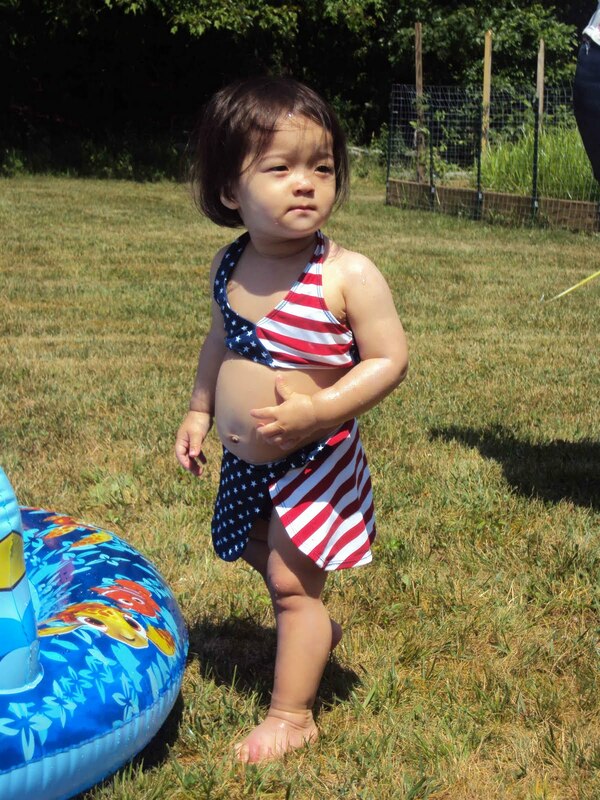 I don't know if we're starting the "terrible twos" a little early, or what, but recently, you've been quite a challenge, Katy! 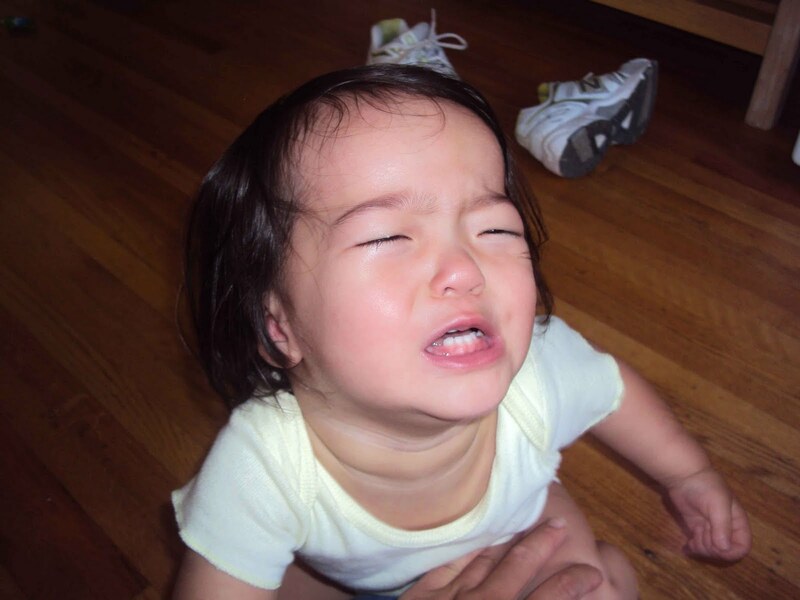 You are a roller coaster of emotions (happy one moment, upset and frustrate the next) and you don't seem to know what you want (first we want to walk to the car, then we want to be carried, then we cry at both...). Getting you into the car seat is quite a struggle, nowadays- you scream and holler like a banshee and make your body go board-straight so that I can't bend you to sit in the seat and buckle (the people in the parking lot around me must be wondering!). I suddenly "get" why there are drive through tellers at banks, drive through fast food, curb-side to go, pick up at dry cleaners and pick up groceries at the store- sometimes, it's just too hard to keep getting a kid in and out of the car seat!! You are exerting your strong-willed nature and sense of independence every day. You want to climb into the car all by yourself. You want to open the door all by yourself. You want to get down from your chair (never mind that it will tumble down on you if you're not careful) all by yourself. You want to throw that one piece of trash out all by yourself. Couple the above with the fact that more molars are coming in and you've got one cranky Katy and one tired mama! Whew- motherhood is definitely WORK! Mommy and Katy running around in the vineyards. 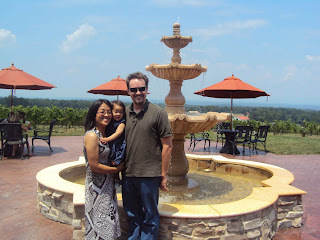 Family Portrait in front of the winery fountain. Katy helping to "decide" which wine to purchase. Today we met up with my cousin Jaclyn, Aunt Karen and Uncle Ron at the Raffaldini Winery to help Jaclyn celebrate her 21st birthday. 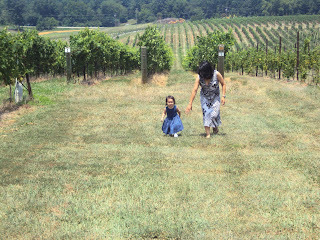 The winery is set in the foothills of NC and though the day was a SCORCHER (!!! ), the setting was picturesque and we had fun tasting some local wines. 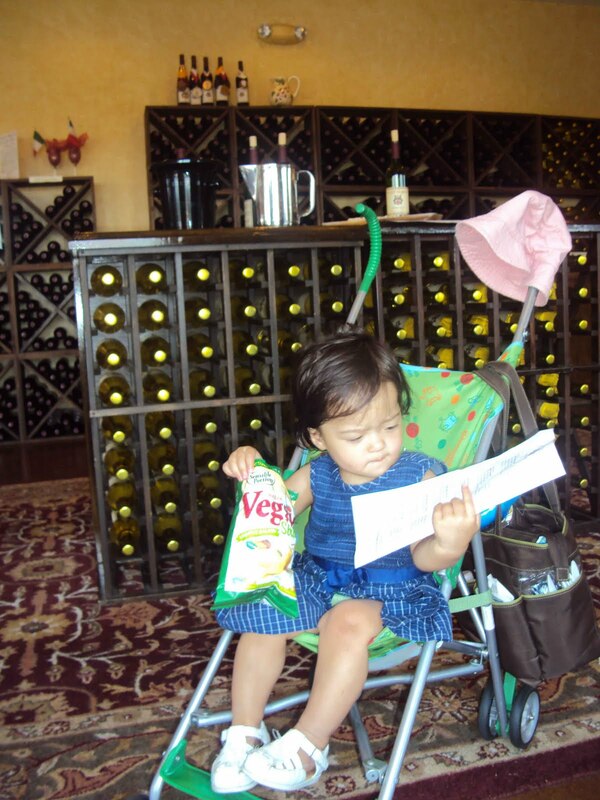 The winery introduced La Dolce Vita, today, so we got to taste that for the first time. Of course you weren't able to taste the wines yourself, Katy, but you did have fun running around in the fields and you were such a good girl while we sampled the wines. 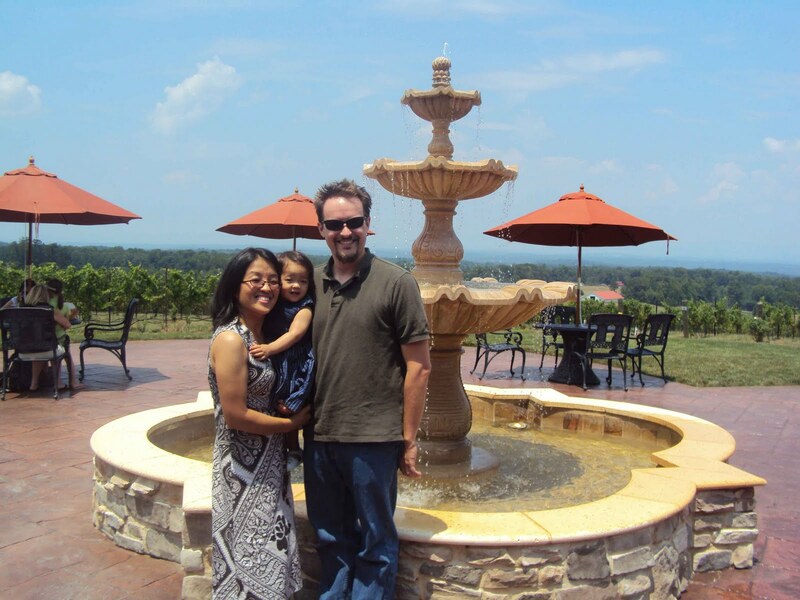 Daddy and I had been talking about going to a NC winery since we moved here five years ago, so it was nice to finally go out and do it. Katy, since it was just you and I, today, we went to Discovery Place Kids. Discovery Place Kids is this really neat "museum" that is sized just right for little kids to run around, explore and experience different areas through touch, sound, and play. 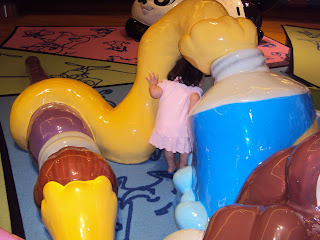 There are nine different theme areas where children can pretend to be a doctor, climb a fire engine, "milk" a cow, "cook" dinner, "run" a diner (complete with counter and red vinyl seats), go to the "bank" drive through, climb a rock wall, "drive" a car, create arts and crafts, "swim" under water and play with water. Dress up hats, coats and various "tools of the trade" abound. Things to create, push, pull, ring, make music with and "pretend" are the main ideas of this fun and exciting children's museum. We can add the word, "Copy" to your vocabulary, Katy. Whenever I'm drinking my morning cup of coffee, you reach for it and insistently cry out, "Copy! Copy! My, mine- copy!" This morning I put the tiniest drop of coffee and a whole lot of milk into Daddy's travel mug and then handed it to you. You snatched the cup from my hands and gulped it down. 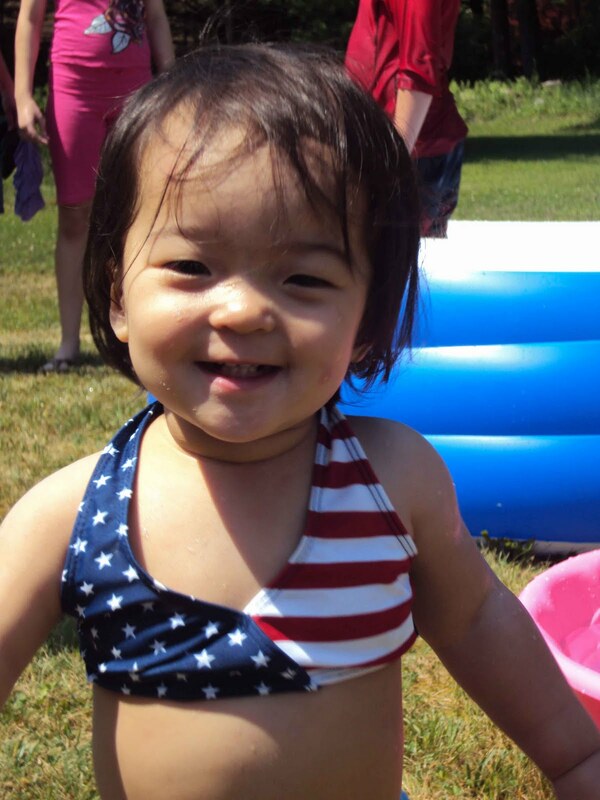 When you finally came up for air, you had the biggest grin on your face, thinking that you were actually drinking Mommy's "copy." 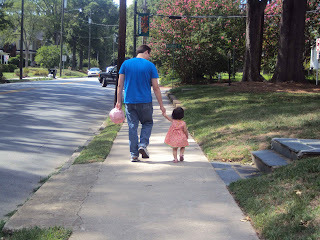 Going on a walk with Daddy. "Hurry up, Mommy- come join us on our walk!" 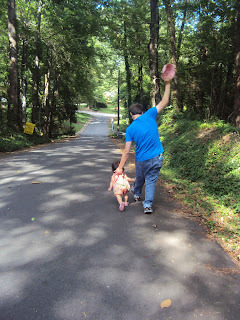 Daddy "improvising" as Katy takes off running. 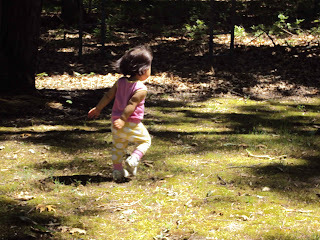 Now that you are older and steadier on your feet (walking and RUNNING EVERYWHERE! ), you insist on walking on your own. You still want to be held on occasion but you love to go "exploring" and take walks on your own. 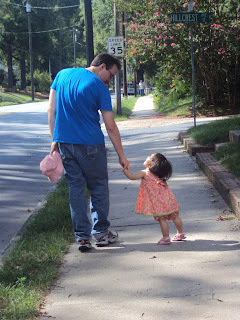 We live on a beautiful, walker-friendly street, so it's nice to go for walk as a family, each night. 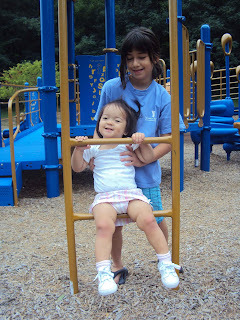 "Hanging" out with Elizabeth at the park (Katy was very proud of herself for climbing up this far and holding on). This past Wednesday, while putting you down for bed, you were making a valiant effort at prolonging bedtime, Katy. You've learned the art of asking for water and doing cute little things that make me smile and laugh instead of "shhhh" you to sleep. Your game of the day was to hide your head under the covers and then pop up quickly while giggling like mad. Of course, this made me laugh. That is, until you gave me a black eye. While coming up from being "hidden" under the covers, you hit my eye just right (or just wrong, depending on how you look at it- pun intended). I saw stars. I cried out in pain and Daddy came running in from the other room (he was listening on the monitor). While Daddy went to fetch some ice, you leaned in and gave my eye a kiss. Sweet baby- black eye and all. After Daddy bathed you tonight, Katy, he asked you, "Katy, who am I?" After careful consideration, you looked at him, tilted your head and said, "MINE!" Isn't that the truth!! Katy smells the fragrant basil. Daddy planted a garden this summer. He planted tomatoes, basil, cucumbers, zucchini, onions and sweet potatoes. 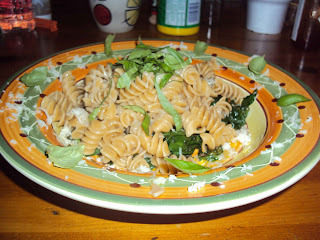 The basil has been growing beautifully so we decided to make a meal of it, tonight. We added fresh basil to our spinach and whole wheat pasta dinner. It was DELICIOUS and you even ate some AFTER already eating your own dinner, Katy. You love drag Daddy out to the garden when he comes home from work. 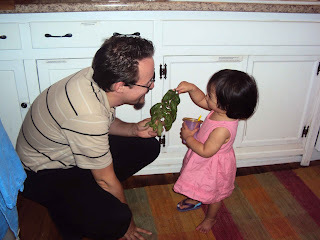 You insist on smelling the basil and love to touch the leaves and help water the plants. 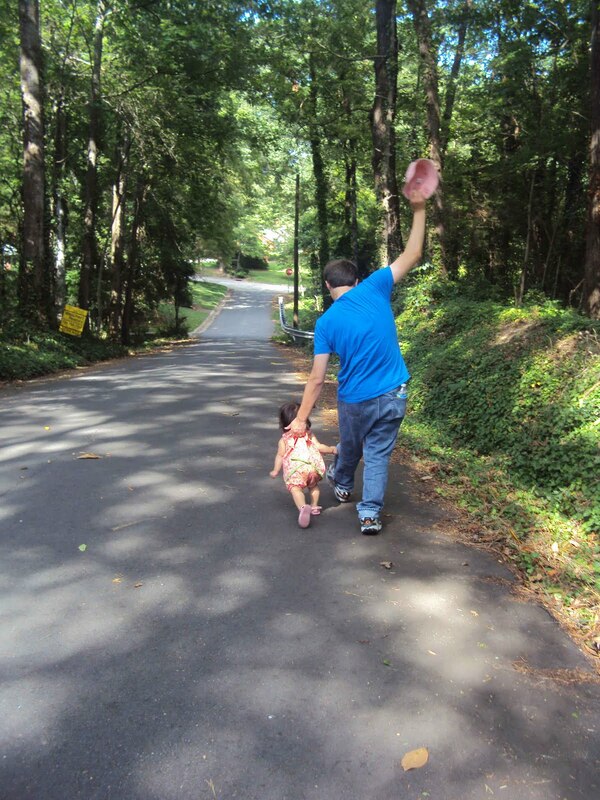 Yesterday, while climbing up on the chair in the living room, you handed Daddy your hat and said, "Hold hat." We're counting this as your first sentence, Katy- along with "Up, peas!" ("Up, Please!") Every day you say a new word and you discover new ways to use your voice. We've got a talker on our hands! Kisses for Daffy Duck (He doesn't look too happy being climbed upon). 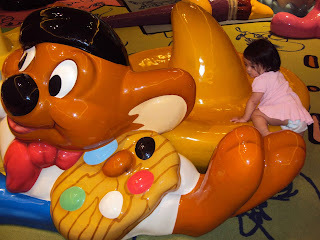 For something new and different, we went to the Northlake Mall, today, to check out their play area. Our friend, Stephanie Perkins, suggested it saying that it is much nicer than Concord Mills Mall. 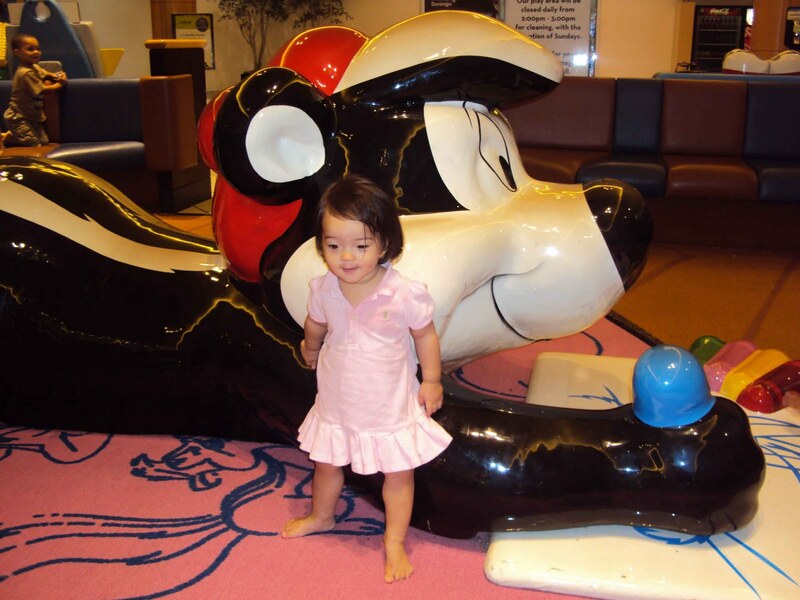 So, we headed to Northlake, took a couple of laps around the mall before it opened and then let you loose, Katy, in the play area. You loved climbing and playing and interacting with all of the other little kids. 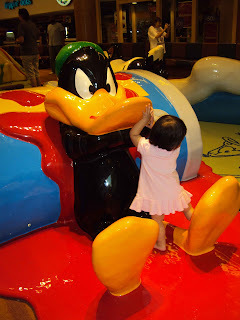 There were a bunch of kids- the play area was crowded! 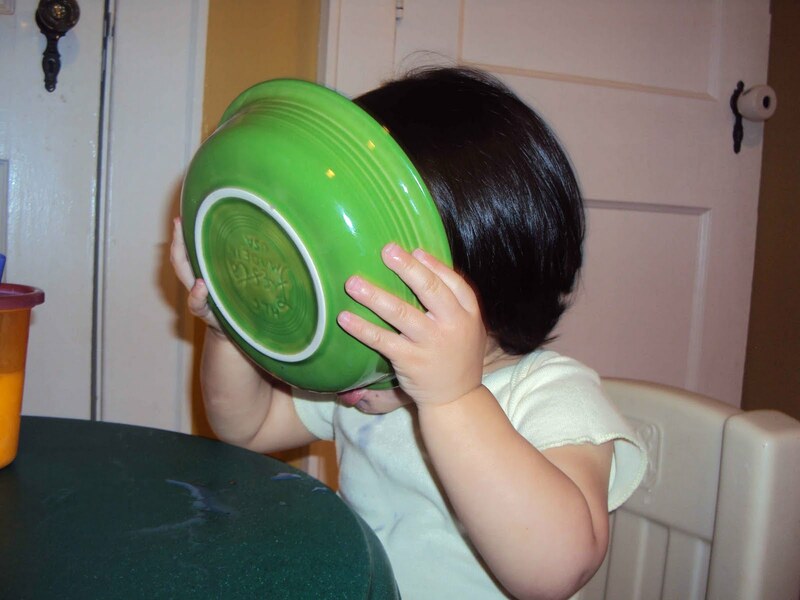 "Hold on, Mom- there's still milk on the bottom of my bowl." "Gotta get every last drop!" You love to dance, jam and groove to music, Katy! Lately, you will pick up your feet and stomp around really fast like you are "dancing." Anytime you hear music, you sway and move to the beat. You smile and love to request "Gack, Gack, peas!" when we get into the car (requesting the song, "All the little duckies"). Your new favorite words are "My" and "Mine." Everything is either "My" or "Mine." Katy reaching for the newspaper, "Mine!" 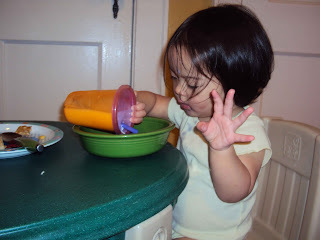 Katy reaching for Daddy's coffee cup, "My!" Katy climbing into her car seat, "Mine!" 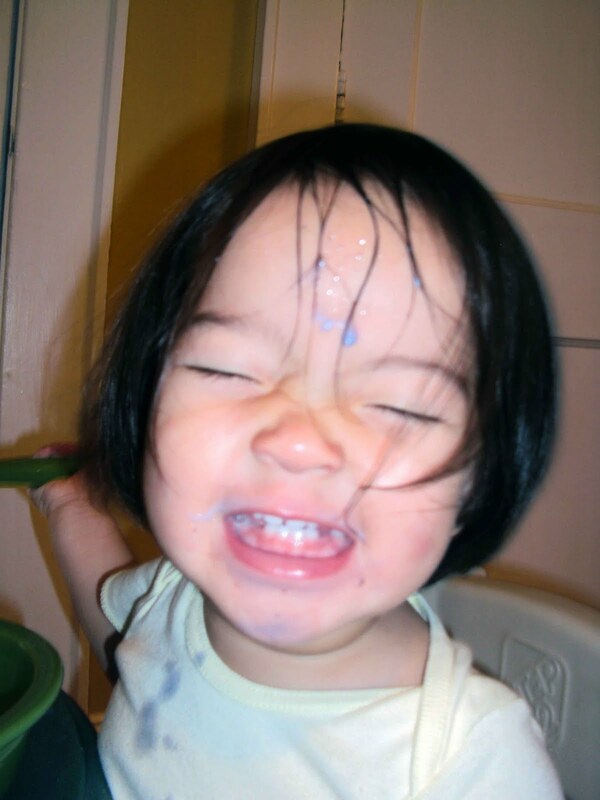 Katy putting a sticker on (as a reward for using the potty), "MINE!" Elizabeth and Katy all dressed up. 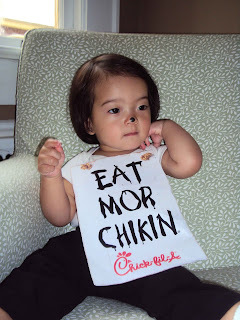 Today was Cow Appreciation Day at Chick-Fil-A. 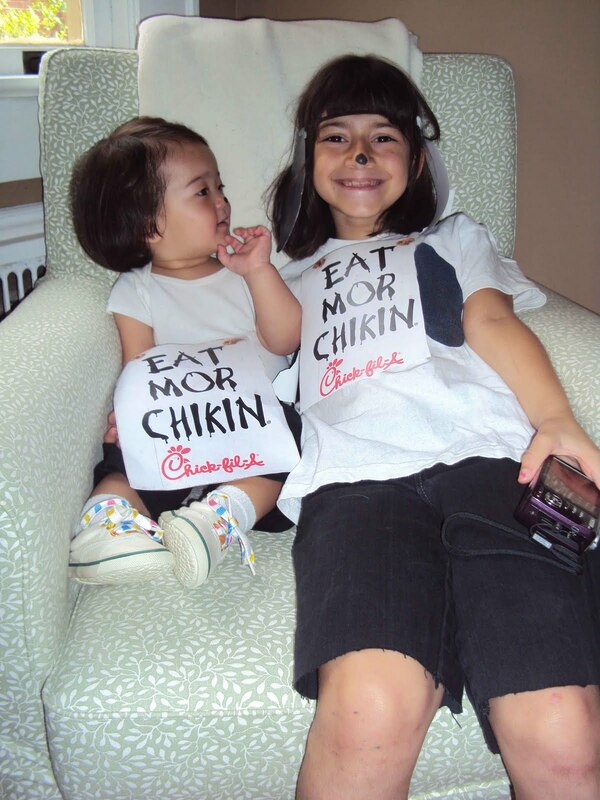 This means that if you dress up like a cow you get a free meal at Chick-Fil-A. 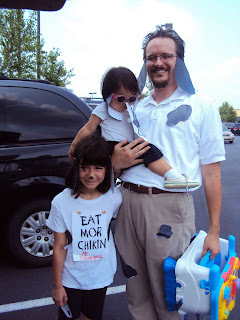 So, we all dressed up like cows and "herded" on over to Chick-Fil-A to partake in the annual event. Daddy even met us there on his lunch break. We had fun dressing up and enjoyed our free meals! Last week, I cut my left pointer finger while slicing some bread. Since then, I've been covering the finger with a band-aid in an effort to protect it from day-to-day activities. This morning, while applying a new band-aid, you came over to me, pointed to my finger, said, "Boo Boo" and then kissed my finger. Melt my heart, Katy- so sweet! 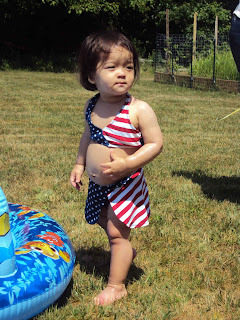 This afternoon, during your nap, Katy, you crawled out of your ghetto crib, opened the bedroom door, came out into the hall and upon seeing me (since I heard you moving around), put your hands on your hips and exclaimed, "Mommy!" 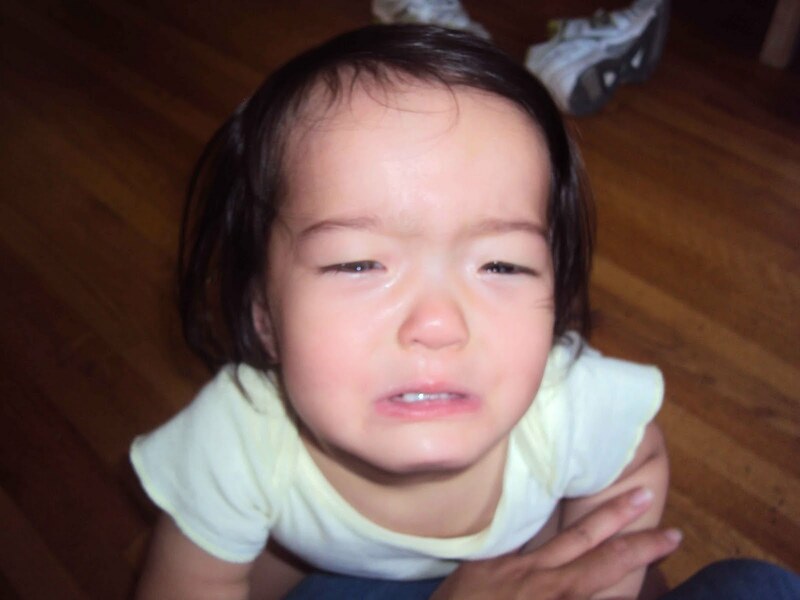 Then, you proceeded to take my hand and drag me back into your room as if to say, "Mommy, why did you leave? Let's nap together!" 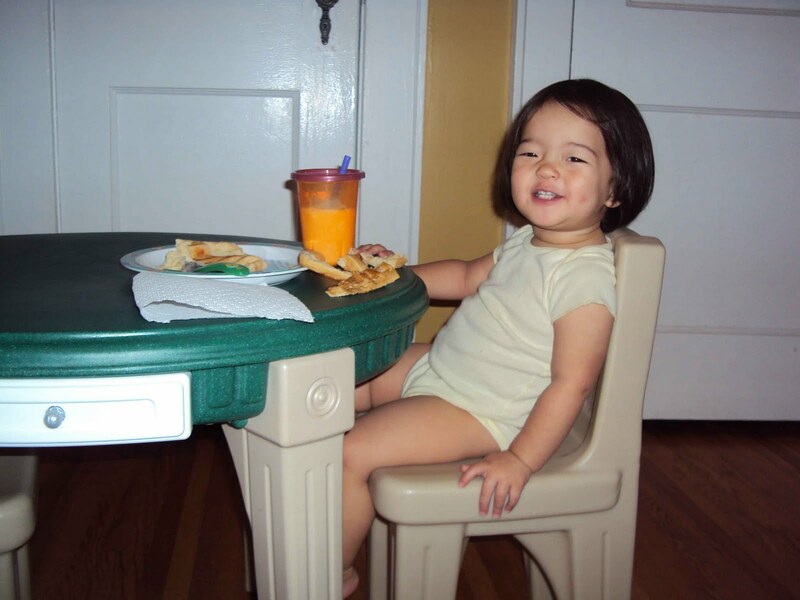 This was the first time you had successfully escaped from your bed while in there sleeping. Today, you actually used the toilet correctly, Katy! Let the potty training begin! Mr. and Mrs. Keys sent us a CD of children's songs that we like to listen to in the car. One of the songs is titled, "Socks and Shoes." You love this song, Katy. In fact, we once spent on straight hour listening to it in the car just because it kept you calm. 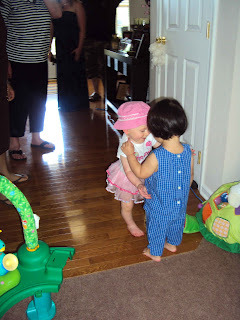 This morning, after dressing you, you started actually SINGING the song- not just saying the words but singing, "Socks and Shoes, shoes and socks..." Then, you promptly marched over to your shoe bin to pick out some shoes to wear with your outfit. Talk about a girl who LOVES her shoes! "Whee!!" 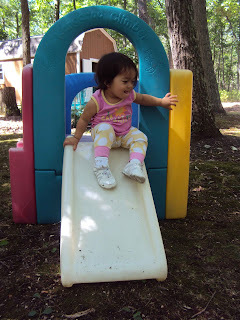 Sliding around and having fun at Nana and Grandpa Jones' house. Katy cooks up something delicious. 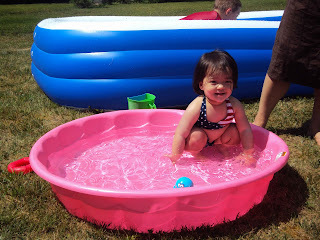 Katy actually gets IN the pool (took some coaxing and she had more fun washing her hands than actually swimming and splashing around in the pool). Katy, since Daddy had Friday and Monday off for the Fourth of July, we took a road trip up to New Jersey to surprise Nana Jones with a visit from her favorite little visitor- YOU! We left late Thursday night and arrived in Tabernacle early, early Friday morning after a LONG drive! Even though Daddy and I were still tired after only a couple of hours of sleep, you still woke up at your normal six-thirty wake up time, Katy. So, you and I went downstairs to play and wait for Nana to wake up and notice her surprise visitor. Aunt Megan was able to "coax" Nana downstairs with a ploy that Grandpa's back was hurting him. When Nana came down the stairs and saw you, Katy, she was so surprised!! We spent the rest of Friday relaxing and resting. 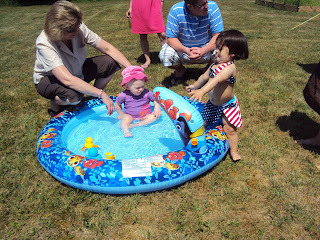 You played and explored new territory with Nana and Grandpa "Bapa". Daddy and I got to see Aunt Megan and Uncle Jason's new house. Mr. Justin Eckart came over to visit with Daddy, Friday night. Nana and Grandpa did a great job at wearing you down because you napped and slept great while at their house. 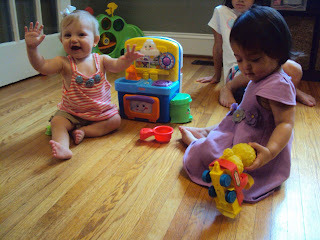 Saturday morning you played with Nana and Grandpa before we left to go to cousin Carly's first birthday party. You and I went for a walk around Wimbeldon Saturday morning. As we were walking, five deer ran across the road. 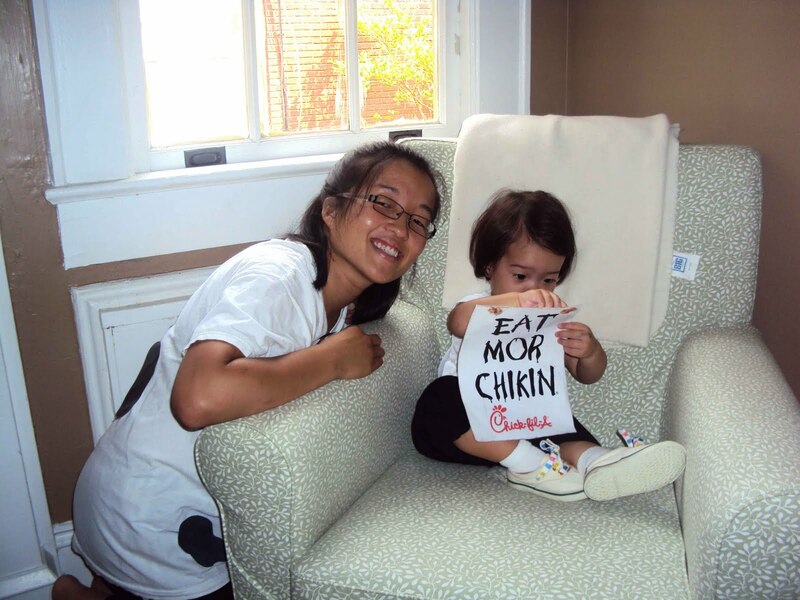 When you saw them, you exclaimed, "Moo!" I guess you can take baby out of the city, but you can't take the city out of the baby :-P.
We had fun wishing Carly a Happy First Birthday and catching up with some of the Petruzzi family. After Carly dug into her cake, we left the party to visit Granny Petruzzi in the hospital in Hazelton. Granny was so happy to see you! You certainly brightened her day, Katy! Sunday morning we went to church with Nana. You did pretty well sitting through half of the service until you got too fidgety to sit still and be quiet. So, I took you downstairs to the Fellowship Hall and ran around and got some of that extra energy out. After church, you took a marathon nap (BY YOURSELF!!!) and then we sat down to a yummy meal of ribs, pasta salad and beans- DELICIOUS! 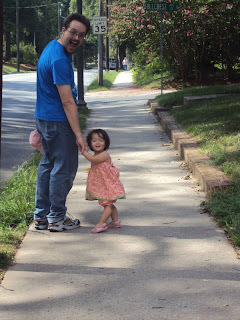 We decided to leave for home Sunday night after we ate dinner in hopes to avoid some holiday traffic. We didn't run into traffic but we did chase a terrible rain storm through Virginia. At one point, we stopped at a VA rest area and we got SOAKED running from the car to the restrooms. You thought it was HILARIOUS that we were getting drenched and you laughed manically all the way (which of course, made me laugh even though I was soaked and the weather was terrible to run and drive in). We arrived home safe and sound at 2:30 AM and we had a good visit with family. 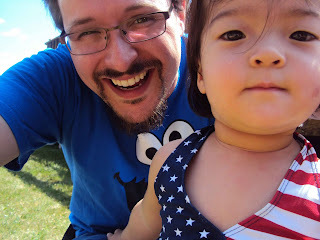 As for our Fourth of July activities, we just took it easy, today, and ate egg rolls for dinner as is our tradition (you wouldn't believe how hard it is to find a Chinese restaurant open on the Fourth!). We stayed far away from riding in the car, today :-).